In our companion study (Jarvis et al. J Comp Neurol. doi: 10.1002/cne.23404) we used quantitative brain molecular profiling to discover that distinct subdivisions in the avian pallium above and below the ventricle and the associated mesopallium lamina have similar molecular profiles, leading to a hypothesis that they may form as continuous subdivisions around the lateral ventricle. To explore this hypothesis, here we profiled the expression of 16 genes at eight developmental stages. These findings support the continuum hypothesis of avian brain subdivision development around the ventricle and influence hypotheses on homologies of the avian pallium with other vertebrates. J. Comp. Neurol. 521:3666-3701, 2013. © 2013 Wiley Periodicals, Inc.
Fr?d?ric Gaillard, Harvey J. Karten and Yves Sauv? The Nile grass rat (Arvicanthis niloticus) has a high proportion of cone photoreceptors (~30?40%) compared with that in the common laboratory mouse and rat (~1?3%) and may prove a preferable murine model with which to study cone-driven information processing in retina and primary visual centers. However, other than regions involved in circadian control, little is known about the retinorecipient structures in this rodent. We undertook a detailed analysis of the retinal projections as revealed after intravitreal injection of the anterograde tracer cholera toxin subunit B. Retinal efferents were evaluated in 45 subcortical structures. Retinal afferents were not detected in the basal forebrain or the dorsal raphe nucleus. Morphometric measurements revealed that the superficial layers of the SC are disproportionately enlarged relative to other retinorecipient regions and brain size compared with rats and mice. We suggest that this reflects the selective projection of cone-driven retinal ganglion cells to the SC. J. Comp. Neurol. 521:1699?1726, 2013. 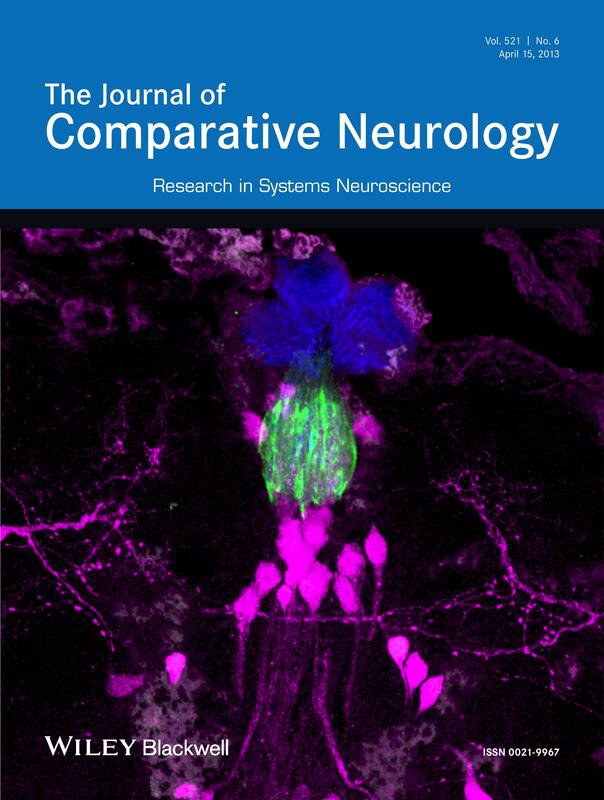 © 2012 Wiley Periodicals, Inc.
Local neurons in the vertebrate retina are instrumental in transforming visual inputs to extract contrast, motion, and color information and in shaping bipolar-to-ganglion cell transmission to the brain. In Drosophila, UV vision is represented by R7 inner photoreceptor neurons that project to the medulla M6 stratum, with relatively little known of this downstream substrate. Here, using R7 terminals as references, we generated a 3D volume model of the M6 stratum, which revealed a retinotopic map for UV representations.Our findings suggest that the Drosophila medulla M6 stratum contains diverse LNs that form repeating functional modules similar to those found in the vertebrate inner plexiform layer. J. Comp. Neurol. 522:3795?3816, 2014. © 2014 Wiley Periodicals, Inc.
Amphioxus (Cephalochordata) belongs to the most basal extant chordates, and knowledge of their brain organization appears to be key to deciphering the early stages of evolution of vertebrate brains. The brain populations studied and discussed in detail were the Retzius bipolar cells, lamellate cells, Joseph cells, various types of translumenal cells, somatic motoneurons, Rohde nucleus cells, small ventral multipolar neurons, and Edinger cells. The results of this comprehensive study provide a framework for comparison of complex adult populations with the early brain neuronal populations revealed in developmental studies of the amphioxus. J. Comp. Neurol., 2015. © 2015 Wiley Periodicals, Inc.